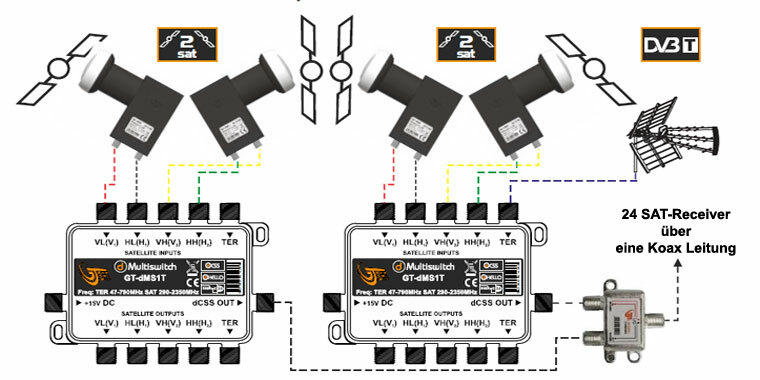 This Unicable multiswitch supports both the Unicable I and the Unicable II protocol. Thus, up to 8 older Sat receivers (Unicable I) and 16 SAT receivers with Unicable II protocol (almost all devices ab 2013). A total of 24 receivers on just one coax line. An 8-way splitter for better distribution is our offer. Of course, with this Unicable system also multiple tuner receivers (Twin Tuner, 4-way tuner, Octo FBC tuner) can be operated via a coaxial line. 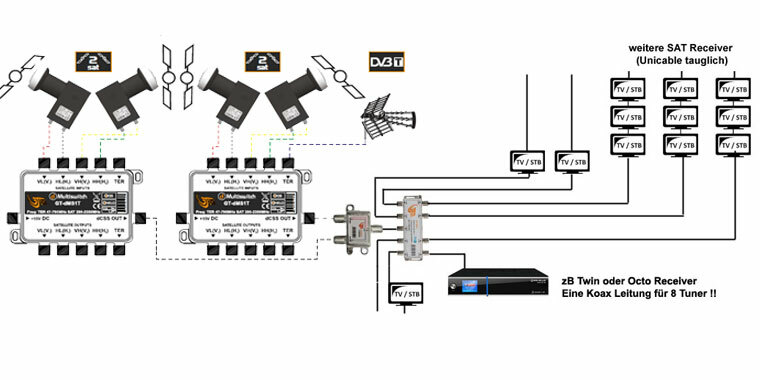 This system allows the reception of 4 satellites with only 8 coax wires coming from the SAT antenna. The four Wideband LNBs needed and a Multi Universal 4-fold LNB bracket are included! For further grinding of the coax cable, either a Unicable compatible SAT socket with DC-passage or a Unicable suitable SAT splitter can be used. An 8x splitter is already included in our SET.